Centrally located in the heart of Hat Yai's main tourist and shopping area. Clean comfortable rooms, swimming pool and all the amenities you will need for a relaxing night. Great value for the money! 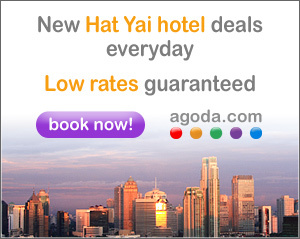 Hat Yai hotels with special promotions and discounts! Coming From Hat Yai Airport to Pak Bara and Koh Lipe: There aren't any mini-buses that go directly from the Hat Yai airport to Pak Bara which is where you need to go to catch a boat or ferry to Koh Lipe. The cheapest option you have is to take a mini-bus to the Hat Yai train station (cost: 80 Thai baht/person), then talk to a travel agency nearby to arrange a mini-bus straight to Pak Bara (cost: 150 Thai baht/person). or.......We can arrange a private taxi or mini-van directly from the Hat Yai airport, or Hat Yai City to Pak Bara pier for 2,500 Thai Baht. Visit our taxi & Bus Schedule or Contact us to arrange this if this is an option you'd like. hotels in Hat Yai page to find the best deals on accommodation in this neat little southern Thailand city.